This pizza crust is made out of flour and time and magic. Every time I make it, a phrase from 1 Corinthians comes to my mind: “A little yeast leavens the whole batch of dough” (1 Cor. 5:6). Whenever I hear that phrase ringing in my head, I feel tempted to tell you that this pizza crust is heavenly…but in fact, yeast represents sin in the Bible, so instead perhaps I should say this crust is so good, it’s almost sinful. Jim Lahey, creator of this amazing crust recipe, is no angel, because I seriously can’t stop making pizza now that I have this crust recipe in my arsenal. 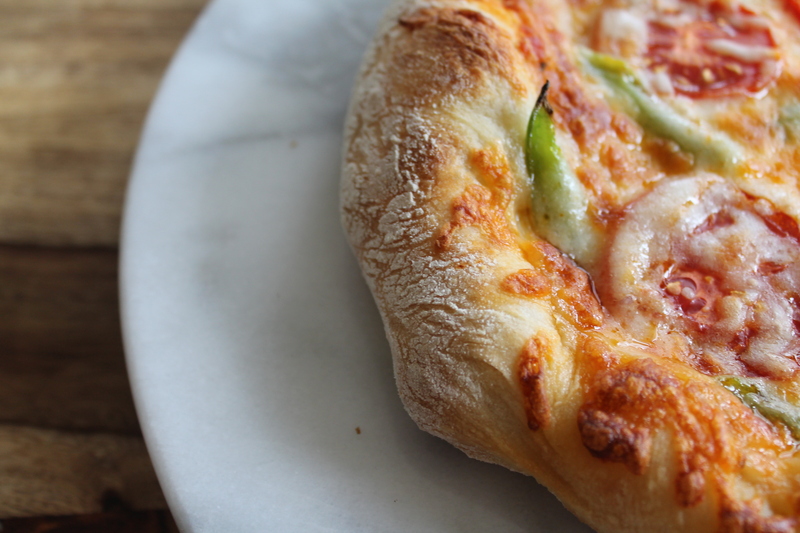 If you have ever fretted about making pizza at home, ever resisted making your own crust or turned out with a flat, boring disc underneath your favorite pizza toppings, I implore you to try this recipe! It’s easier than easy and tastes phenomenal. Thanks to this pizza crust, there is seriously no reason anyone should be buying pre-made pizza dough at the grocery store. Think about it: if you buy a frozen ball of dough, you still have to plan ahead enough to thaw it, and you still have to shape it before you can throw on your favorite pizza toppings. 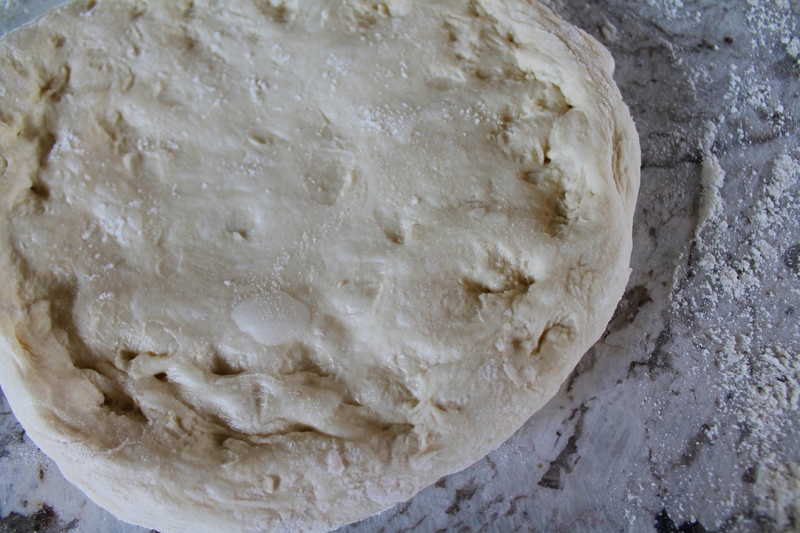 This crust is at least as easy as that: there is no kneading and no rolling, and it has only 4 ingredients, with no unusual chemicals or preservatives! All you need to do is whisk together flour, salt, and a little yeast. Pour water, any temperature, over the flour mixture and stir to combine. Cover the bowl with plastic wrap. Walk away. Ignore that sucker for at least 18 hours and up to 24, just sitting on the counter. It will bubble up beautifully. This dough is a fermenting dough. I do completely find it amazing how so little yeast can produce something so wonderful! Roll each ball in a light layer of flour. Stretching it carefully with your hands, fold the edges in from the top and bottom, then the two sides, so that each folded edge meets in the middle, a little like an envelope. Turn the folded sides to the bottom. 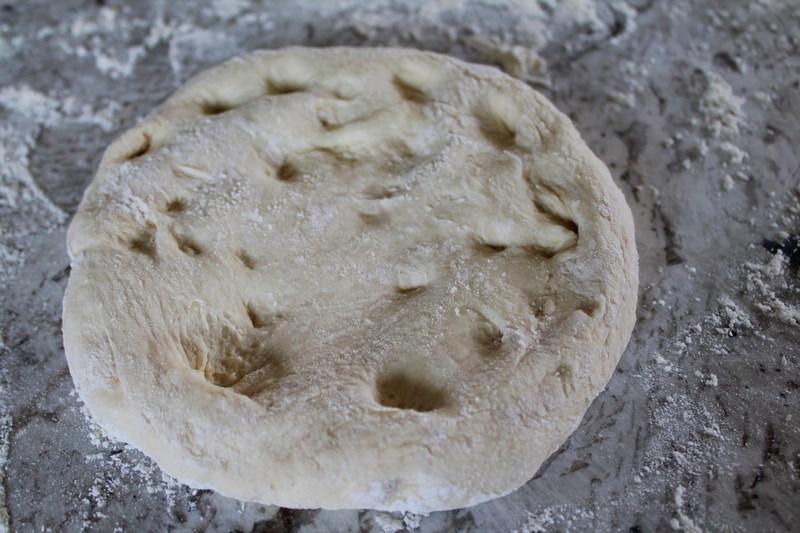 Press the dough out with your fingers into a circle. I sort of dig my fingers in, making little dents and working outward from the center. Stretch it carefully, not pulling the center too tight or so thin that it develops holes. This also helps to define the edge of the crust and keep it thicker for easy grabbing after you bake! I usually end up with small pizzas about 10″ across. The stretching takes a little practice, but I think you will find it easier than rolling, with better results! More air bubbles, more texture, more character. 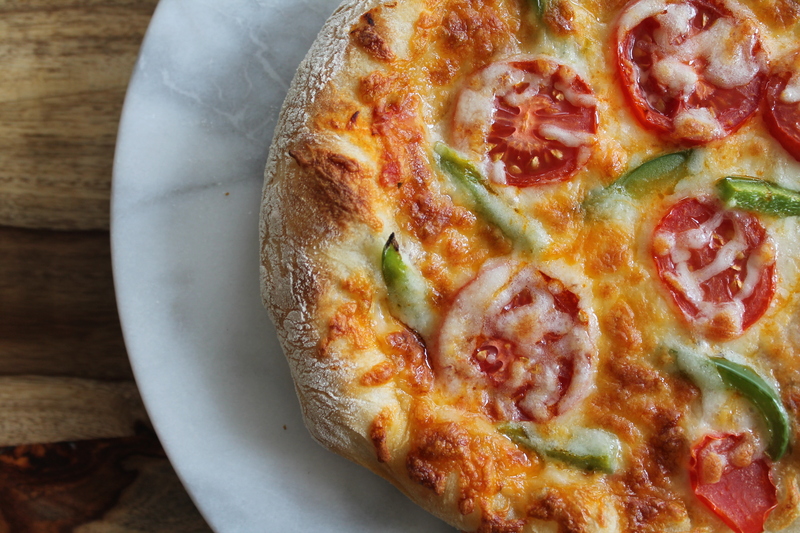 And keep in mind, not every pizza has to be perfectly round. Immediately transfer the shaped dough to a well floured or cornmeal-covered pizza peel or cutting board. Top it as you like! My advice about pizza toppings is to go cautiously in the center, so that it is not too weighed down and is able to bake properly. If you don’t think you will use the dough within 24 hours of mixing it, I suggest letting it rise in the fridge instead. If you ultimately use only part of the dough, then you can wrap the rest in plastic wrap and sit it in the fridge for another 24 hours without too much harm. After that, you may want to think about baking it, because it will continue fermenting and it will start to get a little funky, even in the fridge. 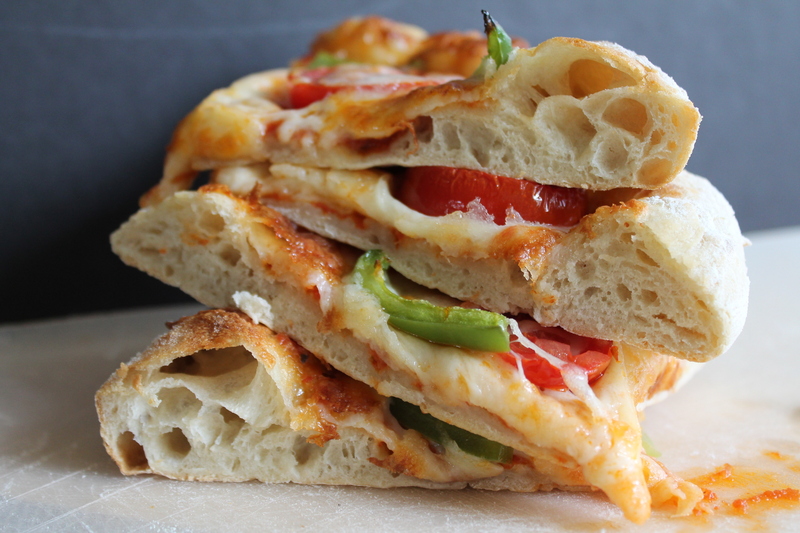 This is probably the best pizza crust ever. Happy baking! 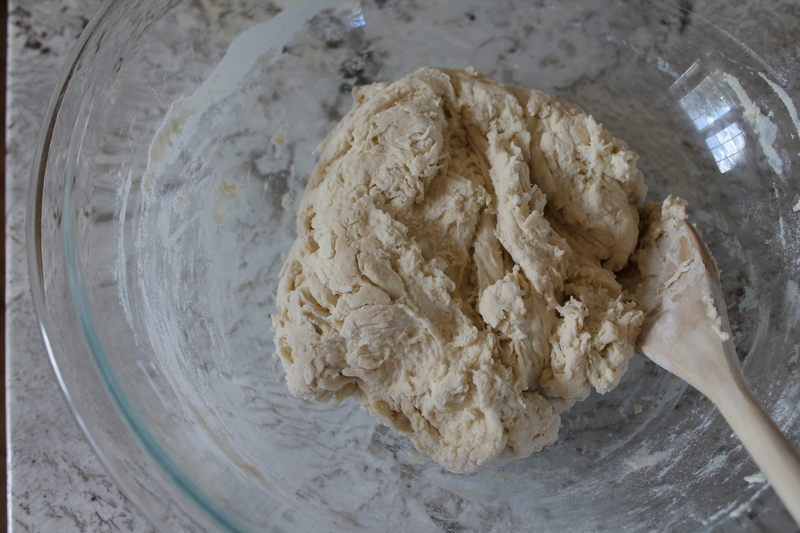 Whisk together the flour, salt, and yeast in a very large bowl. Stir in the water with a wooden spoon. Cover the bowl tightly with plastic wrap and let sit on the counter for 18 hours, or until more than doubled. The fermented dough will be puffed, wet, and bubbly. 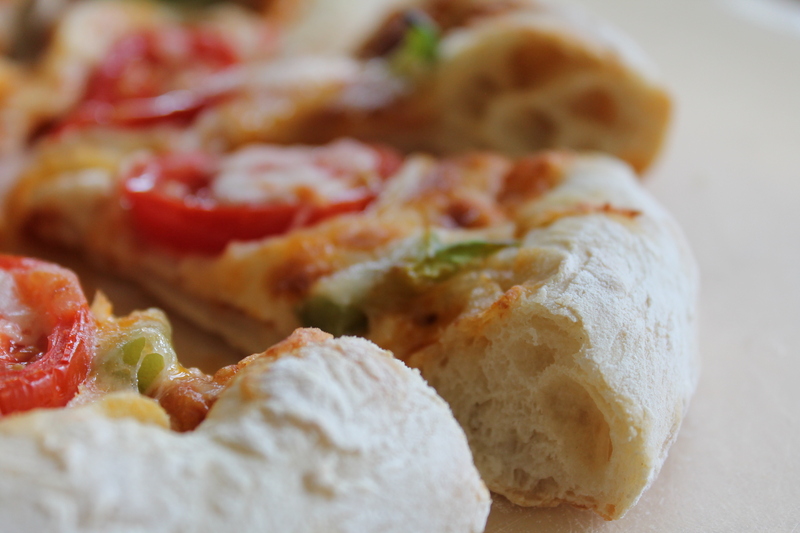 When ready to bake pizza, place a baking stone or heavy cookie sheet in the oven and heat the oven to 500°. Flour a work surface and scrape the dough out of the bowl. Divide it into 3 equal parts and roll them lightly in flour. For each portion, start with the right side of the dough and pull it toward the center; then do the same with the left, then the top, then the bottom. The goal is four folds that meet in the center of the dough mass. Shape each portion into a small ball and turn the seam side down. 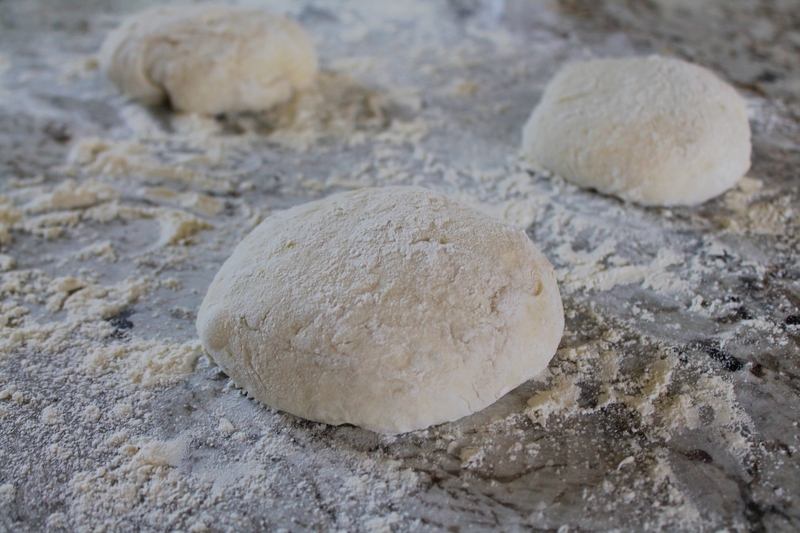 Using clean fingers, press the dough out into a 10″ round, slightly thicker at the edges than the center. Take care not to pop all the air bubbles while shaping. Transfer the dough to a cornmeal- or flour-covered pizza peel and top as desired. Slide the raw pizza off the pizza peel onto the hot stone in the oven. 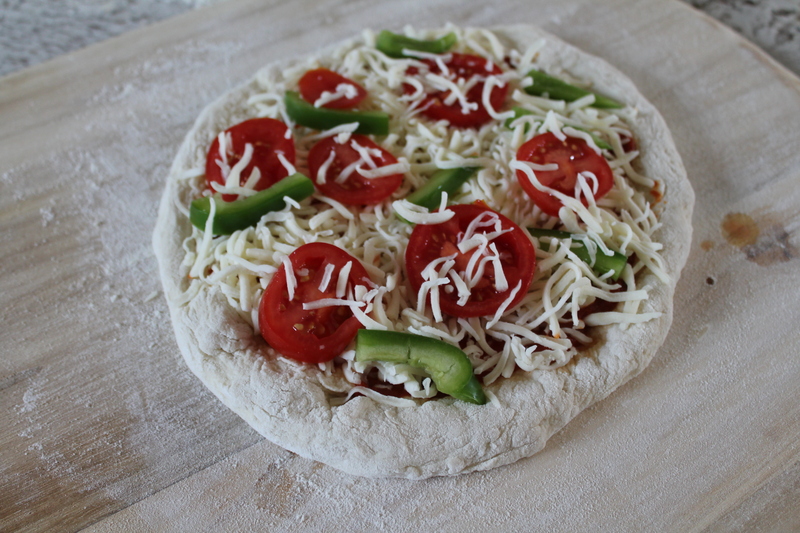 Bake for 10 minutes, or until the crust is puffed and lightly browned and the cheese is bubbly.